These aren’t your Italian Nonna’s meatballs by any stretch of the imagination. Sorry Nonna, I just might prefer Grandma Phuong’s Vietnamese version a little more. And speaking of Grandma Phuong, does Vietnam have the stereotype of a wizened old woman cooking away like our own visions of granny back home? But I digress…Another day and another dollar spent at Cafe 91 brings experience #20 of 365 to the table. Have you figured out by now how much I love eating in Vietnam? Where else can you get a full meal of meat, rice, vegetable, soup and banana for just one George Washington. What does a buck buy back home anyway? Let’s venture back to Cafe 91 squatting just a little too conveniently in the alley next to my apartment tower…The daily selections such as fish fillets complete with skin and spine still bask a little too authentic in their serving dishes for my virgin tastes so I can’t even describe the relief of spying a few meatballs floating in a watery red sauce. As mesmerizing as pieces of bone in pork with rubbery skin screaming out, “pick me, pick me!” are, in the end I am just not ready for the big leagues yet. 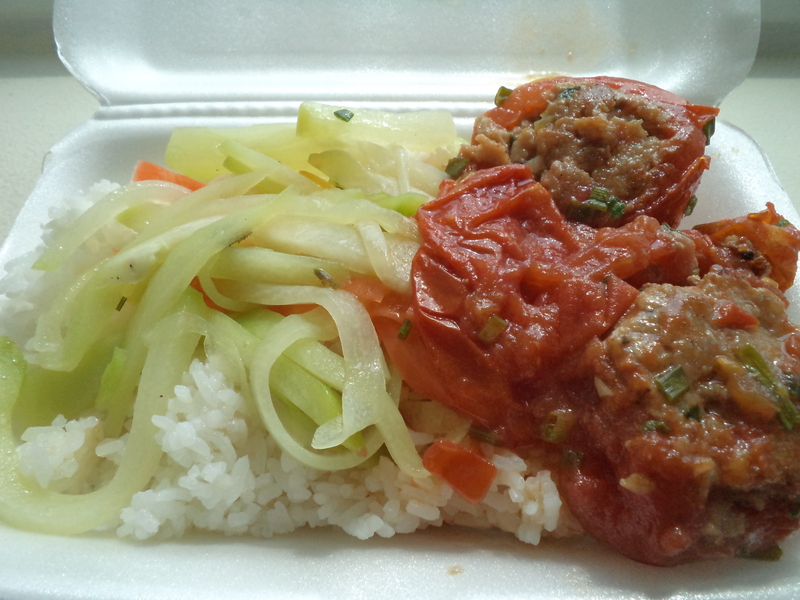 Some tiny grey balls stuffed inside tomatoes looked benign enough and within minutes found a new home in a styrofoam container atop some steamed rice. These meatballs have a sweet almost breakfast sausage taste (minus the sage), and a softer, fattier texture than Nonna’s ground beef meatballs makes these break apart nicely to the touch. As much as I go out of my way to cook and eat low fat, I find myself falling off the wagon over here with dishes like this. But then again, my own grandma always said anything in moderation is ok. I certainly think two small Vietnamese meatballs qualify as the model of moderation far from the Texas size portion of 12 meatballs competing with a foot high pile of pasta drowning in a river of sauce at an American restaurant. Visions of suburban chain restaurants got me to thinking about the differences in our cuisines. Over here everything from the food preparation to final presentation is all about freshness, balance and harmony. Ingredients all work together without one overpowering and usurping the taste of another. Move 8000 miles east across the Pacific and we have portion control problems with one component easily drowning the others. That Sysco truck disgorging its factory made finest through a restaurant’s service door under the cover of darkness gives all evidence needed to know about the “freshness” of the ingredients as well. Oh how I wish Vietnam’s food market culture existed in the US so we could enjoy the freshest foods going. And how many times have you pushed back from a restaurant table unable to remember that meal because the largely tasteless previously frozen portion stuffed you beyond misery? Smaller, lighter, fresher helpings made from scratch here in Vietnam leave me craving more. My cabin crew are turning out to be a fantastic and helpful resource for my food questions, and Anthony once again impressed me with his knowledge of his native cuisine. I showed him a picture of the meatballs and right away he knew them as cà nhồi thịt or pork stuffed tomatoes. The ingredients are simple…ground pork, salt, tomato, garlic and sugar. Now stuff a halved and cored tomato with this flavorful meat filling and we are well on our way to some more Vietnamese food excellence. Pan frying these red and grey balls softens the tomatoes and creates a sauce surprisingly lacking fish sauce What? 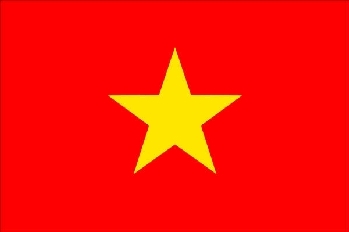 No nước mắm? I incredulously queried Anthony twice about this glaring omission of fish sauce. It’s in everything else so why not this? Unbelievable. I want my nước mắm damn it. One of these days I will graduate to the more interesting offerings at the little blue food shop at 91 Nguyen Huu Canh in the Binh Thanh District. The place does a good lunch only business serving up food that isn’t the best in the world but is far, far from being bad. I like it a lot and it keeps me nicely fed a few times a week. Cafe 91’s cà nhồi thịt beats a lunchtime drive through hamburger in the US by a long shot.